Lava International Limited today announced its commitments and undertaken efforts to popularize digital learning trends among students in India. Under this initiative Lava has announced the launch of 1st lot of M-TAB which was delivered to Students in Meghalaya under Government’s Student Digital Learning Scheme. The company believes that this will open a whole new world of easily accessible information for students for easy and smart learning keeping then at par with global revolution. By popularizing Digital reading platform, Lava plans on capitalizing on the education market which is expected to increase to Rs 602,410crore by 2015. This will help Lava in penetrating its range of tablets in India. 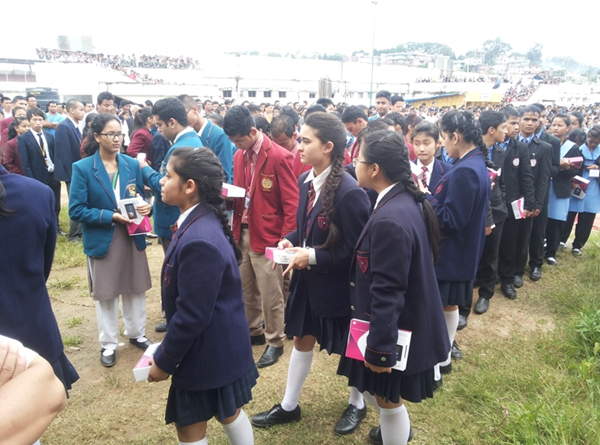 Lava announced the launch of the first lot of M-TAB in Meghalaya, where eleven thousand units were delivered to students under the Government’s Student Digital Learning Scheme. Lava has partnered with iProf, a pioneer in Digital Education solutions to launch this tablet. These tablets will come preloaded with CBSE and State board reading content for class XI and XII along with Sample question papers for Medical and Engineering examinations. Various videos and Audio books have also been added to the 8 GB memory card to help and motivate students. This tablet comes with 1.5 GHz Dual core processor and 1 GB RAM. The internal storage is 4 GB. The tablet sports a 7 inch display with 1024 x 600 pixel resolution. The tablet operates on Android 4.1 Jelly bean operating system and 3G support via dongle. The battery capacity is pretty good at 3700 mAh and the tablet also sports a 2 MP camera at the back. Other connectivity features include Wi-Fi, USB 2.0 port, HDMI port and Bluetooth. The specifications will suffice for learning purpose which includes reading text files and Multimedia content. The education sector is going through a transformation and this is a good initiative to get Indian students familiarized with Global trends and to sync them with the upcoming Digital world. India is now the third largest Smartphone market in the world and our portable devices will be integrated further in every aspect of our lives in the coming times.